Richie Crampton is a Top Fuel winner once again. Richie Crampton ended a Top Fuel futility streak dating to the 2015 season and became the 10th driver to win for NHRA icon Conrad “Connie” Kalitta with a victory in Sunday’s 49th annual AMALIE Motor Oil NHRA Gatornationals. Crampton recorded an uncontested final-round win when he wheeled his Kalitta Air/DHL dragster to a 1,000-foot pass in 3.854-seconds at 314.90 mph after Shawn Reed was forced to shut down his dragster on the starting line due to a fuel leak. Crampton earned his first Wally trophy since the NHRA FallNationals at Texas Motorplex in 2015, his first event victory at historic Gainesville Raceway in Florida and eighth overall. “Fast Jack” Beckman (Funny Car), Tanner Gray (Pro Stock) and Eddie Krawiec (Pro Stock Motorcycle) also emerged as winners in their respective categories at the third of 24 events on the 2018 NHRA Mello Yello Drag Racing Series schedule. Crampton began racing in his native Australia in the Supercharged Outlaw class. Crampton qualified for his NHRA Super Comp and Top Alcohol Dragster licenses before making his professional debut in Top Fuel at the 2013 season-opening Winternationals in Pomona, Calif.
A tour regular since the 2014 season, Crampton and co-crew chiefs Rob Flynn and Kalitta qualified 10th on the 16-car ladder after failing to make it down the track cleanly in four attempts during time trials. Crampton’s best lap was 3.942-seconds at 305.49 mph. Crampton went on to defeat teammate Doug Kalitta, Connie’s nephew, for the second time in three races this season to advance to the quarterfinals for the first time in 2018. Crampton then eliminated Top Fuel newcomer Mike Salinas, who crossed the centerline attempting to catch the Aussie and was disqualified. Crampton next faced-off against fellow-Toyota Racing driver Antron Brown, the three-time world champion from Don Schumacher Racing. Crampton prevailed to reach his 10th career final and second in 10 races since joining Kalitta Motorsports. Crampton’s win over Reed was the 96th overall for Kalitta’s organization. Reed, who advanced to his first career final, started from the No. 12 position and defeated Pat Dakin, eight-time world champion Tony Schumacher and No. 1 qualifier Clay Millican before his misfortune against Crampton. “It was pretty interesting,” Crampton said. “As always, we were able to make great power at Gainesville. The track temps were just up a bit and it makes the crew chiefs just pull their hair out. It made it a little bit more of a driver’s race and it evened the playing field a little bit. I thrived on it. I loved it. It was one of my most rewarding wins ever. “It wasn’t all that long ago that I was sitting on the sidelines, reminiscing about when I used to drive a Top Fuel car. So to be back in a car for Connie, Kalitta Air, DHL, Toyota and everyone, I’m just really lucky. I’m just working hard to try to make sure I deserve to drive for this team. Beckman claimed his career-first Funny Car victory at Gainesville with a hole-shot, 1,000-foot win in 4.035-seconds at 323.58 mph in his Infinite Hero Dodge Charger R/T against Don Schumacher Racing teammate Matt Hagan. After qualifying on pole Saturday, Beckman secured his first victory since Gateway Motorsports Park in Madison, Ill., last October. “The Gatornationals came on the schedule in 1970 when NHRA went from four races to seven,” said Beckman, the 2012 world champion and a student of the straight-line sport. “That was the super season, the first year they crowned a Funny Car champion. 1970 was a big year for our sport, and it’s been at this track ever since then and I’ve never gotten close. It was such a Bucket List thing (to win the event). Beckman defeated Jim Campbell, 2015 world champion Del Worsham and Shawn Langdon before entering his first final of the season. Two-time world champions Hagan and Robert Hight of John Force Racing experienced side-by-side explosions during the quarterfinals, destroying the bodies of both floppers. Hight’s Auto Club of Southern California Chevrolet Camaro SS crossed the finish line in 4.067-seconds and 265.53 mph, following Hagan’s 4.027-second pass at 291.26 mph. Team-owner John Force, a 16-time world champion, experienced his third engine explosion in as many races this season during qualifying on Friday and remained uncertain of the cause after being eliminated Sunday by daughter Courtney Force in Round 1. With that background, Hight and crew chief Jimmy Prock later determined an internal chain reaction led to a dramatic explosion as Hight was pulling off the line. “It kicked two rods out when it blacked the bearings in the crank and then it hit the valves which blew it up,” Hight said. “The car gave me no indication at all before it exploded. “What really scared me was once I got it under control and I looked over and saw his (Hagan’s) body was off his car. I’m thinking, ‘Oh man, he got gathered up in me.’ Then I stood up and looked and his injector was sideways. I realized he had an explosion as well. We’re just lucky we didn’t get into each other. I didn’t know who won. I was hoping we got the win light and we could come back and get another car together and try and win this race. Hagan brought out a back-up Charger body to defeat DSR teammate Ron Capps’ Dodge in the semifinals and advance into his second final of the season. “We had a pretty great race day, to be honest,” said Hagan, driver of the Mopar Express Lane Dodge Charger R/T. “I’ve never been to the finals in Gainesville. We obviously had a huge blow-up in the second round, then to watch these guys pull the other car back out and put it together in the amount of time they had, then turn a win light on against Capps, then to be able to go to a final, it was huge and it speaks for itself. In Pro Stock, Gray powered his Gray Motorsports Valvoline Chevrolet Camaro SS to victory with a quarter-mile run in 6.588-seconds at 210.18 mph to defeat reigning world champion Bo Butner in the final. 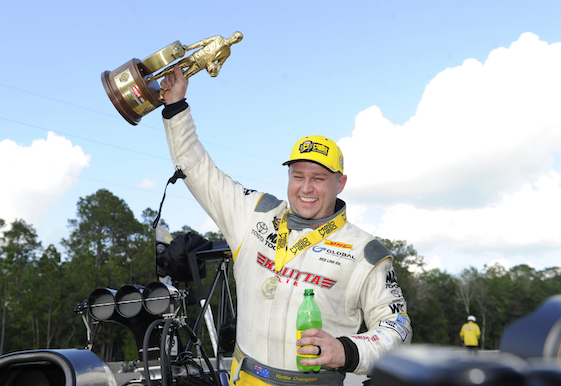 Gray’s first victory at Gainesville Raceway made him a third-generation NHRA national event- winner. Gray’s father, Shane, won the Gatornationals in the Factory Hot Rod class in 2017 in his Camaro SS. Tanner’s grandfather, Johnny, earned the Funny Car title in 2013. First driver since 2015 to win from the No. 11 position, Gray defeated Deric Kramer, Arizona Nationals winner Chris McGaha and Vincent Nobile. Butner, of Ken Black Racing, qualified his Jim Butner’s Auto Sales Camaro SS fifth and bested five-time world champ Jeg Coughlin Jr., Alan Prusiensky and Drew Skillman before facing Gray. Krawiec, a four-time/reigning Pro Stock Motorcycle world champion, rode to victory with a quarter-mile pass in 6.824-seconds at 198.44 mph aboard his Screamin’ Eagle Vance & Hines Harley-Davidson Street Rod. The New Jersey native scored his sixth event victory and third consecutive at Gainesville. The No. 2 qualifier, Krawiec defeated 2010 world champion LE Tonglet, Steve Johnson and 2009 world champ Hector Arana before meeting No. 1 qualifier Hines in the final. The 2018 Mello Yello season will continue with the inaugural DENSO Spark Plug NHRA Four-Wide Nationals at The Strip at Las Vegas Motor Speedway April 6-8. Top Fuel _1. Richie Crampton; 2. Shawn Reed; 3. Clay Millican; 4. Antron Brown; 5. Leah Pritchett; 6. Terry McMillen; 7. Tony Schumacher; 8. Mike Salinas; 9. Brittany Force; 10. Doug Kalitta; 11. Scott Palmer; 12. Pat Dakin; 13. Terry Haddock; 14. Terry Totten; 15. Audrey Worm; 16. Steve Torrence. Funny Car _ 1. Jack Beckman; 2. Matt Hagan; 3. Ron Capps; 4. Shawn Langdon; 5. Del Worsham; 6. Robert Hight; 7. Tommy Johnson Jr.; 8. Courtney Force; 9. Bob Tasca III; 10. Cruz Pedregon; 11. Gary Densham; 12. Jim Campbell; 13. John Force; 14. Tim Wilkerson; 15. Dave Richards; 16. J.R. Todd. Pro Stock _ 1. Tanner Gray; 2. Bo Butner; 3. Drew Skillman; 4. Vincent Nobile; 5. Chris McGaha; 6. Val Smeland; 7. Alan Prusiensky; 8. Greg Anderson; 9. Deric Kramer; 10. Jeg Coughlin Jr.; 11. Alex Laughlin; 12. John Gaydosh Jr.; 13. Erica Enders; 14. Wally Stroupe; 15. Kenny Delco; 16. Jason Line. Pro Stock Motorcycle _ 1. Eddie Krawiec; 2. Andrew Hines; 3. Hector Arana; 4. Scotty Pollacheck; 5. Cory Reed; 6. Steve Johnson; 7. Karen Stoffer; 8. Angelle Sampey; 9. Jerry Savoie; 10. Angie Smith; 11. Ryan Oehler; 12. Hector Arana Jr.; 13. Jim Underdahl; 14. Joey Gladstone; 15. Mark Paquette; 16. LE Tonglet. Top Fuel _ Richie Crampton, 3.854-seconds, 314.90 mph def. Shawn Reed, Broke. Funny Car _ Jack Beckman, Dodge Charger, 4.035, 323.58 def. Matt Hagan, Charger, 4.034, 322.04. Pro Stock _ Tanner Gray, Chevy Camaro, 6.588, 210.18 def. Bo Butner, Camaro, 6.605, 210.34. Pro Stock Motorcycle _ Eddie Krawiec, Harley-Davidson, 6.824, 198.44 def. Andrew Hines, Harley-Davidson, 6.853, 197.19. Top Alcohol Dragster _ Chris Demke, 5.305, 273.33 def. Josh Hart, 5.313, 270.70. Top Alcohol Funny Car _ Sean Bellemeur, Chevy Camaro, 5.460, 268.28 def. Annie Whiteley, Camaro, 5.483, 270.43. Pro Modified _ Rickie Smith, Chevy Camaro, 5.794, 249.76 def. Mike Janis, Camaro, 6.597, 159.91. Top Fuel Harley _ Tii Tharpe, Dixie, 6.313, 230.29 def. Bob Malloy, Buell, 6.546, 172.89. Competition Eliminator _Frank Aragona, Dragster, 7.332, 181.52 def. Greg Kamplain, Dragster, 6.829, 194.02. Super Stock _ Kevin Riner, Chevy Camaro, 11.014, 101.01 def. Pat Clifford, Chevy Cavalier, 10.009, 119.96. Stock Eliminator _ Jeff Taylor, Chevy Camaro, 9.816, 129.40 def. Kenneth Miele, Ford Mustang, 8.864, 150.33. Super Comp _ Greg Slack, Dragster, 8.911, 170.75 def. Ray Miller Jr., Dragster, 8.910, 185.87. Super Gas _ Jim Perry, Chevy S-10, 9.912, 158.69 def. Michelle Furr, Chevy Corvette, 9.933, 154.95. Top Sportsman presented by RacingRVs.com _ Ronnie Proctor, Ford Mustang, 8.583, 123.64 def. Lester Johnson, Chevy Bel Air, Foul/Red Light. Top Dragster presented by RacingRVs.com _ Alan Kenny, Dragster, 6.291, 188.75 def. Steve Cohen, Dragster, Broke. Factory Stock Showdown _ Stephen Bell, Chevy Camaro, 8.176, 167.47 def. Aaron Stanfield, Camaro, 14.967, 77.46. FINAL _ Crampton, 3.854, 314.90 def. Reed, Broke. FINAL _ Beckman, 4.035, 323.58 def. Hagan, 4.034, 322.04. FINAL _ Gray, 6.588, 210.18 def. Butner, 6.605, 210.34. FINAL _ Krawiec, 6.824, 198.44 def. Hines, 6.853, 197.19. Top Fuel _1. Steve Torrence, 217; 2. Antron Brown, 210; 3. Clay Millican, 204; 4. Tony Schumacher, 198; 5. Doug Kalitta, 182; 6. Richie Crampton, 163; 7. Scott Palmer, 161; 8. Leah Pritchett, 147; 9. Brittany Force, 117; 10. Terry McMillen, 116. Funny Car _1. Matt Hagan, 268; 2. Jack Beckman, 247; 3. Courtney Force, 219; 4. Ron Capps, 218; 5. Robert Hight, 185; 6. Tommy Johnson Jr., 182; 7. Shawn Langdon, 174; 8. (tie) Jonnie Lindberg, 117; J.R. Todd, 117; 10. Del Worsham, 116. Pro Stock _ 1. Bo Butner, 245; 2. Jason Line, 232; 3. Chris McGaha, 213; 4. (tie) Deric Kramer, 190; Drew Skillman, 190; 6. Greg Anderson, 186; 7. Tanner Gray, 176; 8. Alex Laughlin, 175; 9. Vincent Nobile, 170; 10. Erica Enders, 166. Pro Stock Motorcycle _1. Eddie Krawiec, 123; 2. Andrew Hines, 107; 3. Scotty Pollacheck, 76; 4. Hector Arana, 71; 5. (tie) Steve Johnson, 53; Angelle Sampey, 53; 7. Karen Stoffer, 52; 8. Cory Reed, 51; 9. Joey Gladstone, 39; 10. Hector Arana Jr., 38. “Tricky” Rickie Smith drove to victory during Sunday’s E3 Spark Plugs NHRA Pro Mod Drag Racing Series presented by J&A Service portion of the 49th annual AMALIE Motor Oil NHRA Gatornationals at Gainesville Dragway. The weekend’s Pro Mod racing, presented by Jerry Bickel Race Cars, was the first of 12 events this season. Smith covered the traditional quarter-mile in 5.794-seconds at 249.76 mph in his Chevrolet Camaro to take down Mike Janis in the final and earn his first victory since last season in Englishtown, N.J., and the 12th of his career. Smith defeated Bob Rahaim, Jim Whiteley and Mike Castellana en route to the final. Smith, a former Pro Stock regular, finished the 2017 Pro Mod season ninth in the standings. He exited historic Gainesville Raceway as the point-leader in pursuit of his fifth championship. Janis secured the fifth runnerup result of his Pro Mod career, as he continues to chase his first victory since the 2015 season. The E3 Spark Plugs NHRA Pro Mod Drag Racing Series will continue at the 31st annual NHRA SpringNationals at Royal Purple Raceway in Baytown, Texas, on April 20-22. Pro Modified _ 1. Rickie Smith; 2. Mike Janis; 3. Mike Castellana; 4. Chad Green; 5. Steve Jackson; 6. Todd Tutterow; 7. Doug Winters; 8. Jim Whiteley; 9. Khalid alBalooshi; 10. Jose Gonzalez; 11. Dan Stevenson; 12. Steven Whiteley; 13. Jeremy Ray; 14. Carl Stevens; 15. Shane Molinari; 16. Bob Rahaim. FINAL _ Smith, 5.794, 249.76 def. Janis, 6.597, 159.91. Pro Modified _1. Rickie Smith, 115; 2. Mike Janis, 94; 3. Mike Castellana, 78; 4. Chad Green, 68; 5. Steve Jackson, 57; 6. Todd Tutterow, 53; 7. Jim Whiteley, 52; 8. Doug Winters, 51; 9. Shane Molinari, 36; 10. Steven Whiteley, 34.